Your Rugby Sevens hangover is long gone, just in time for the cultural wonderland of Tuen Ng – the Hong Kong Dragon Boat Festival. The largest dragon boat competitions in the world take place over the three-day weekend, and we’ve got your district-by-district guide to where to watch 2014 Dragon Boat races and Dragon Boat Festival activities. Join in the revelry as hundreds of local and international teams vie for dominance, mate. The biggest and brashest of this weekend’s races, the Sun Life Stanley International Dragon Boat Championships will host over 200 international and locally based teams and an exponential amount of spectators who are in it to win it, whether that be the championship or the general debauchery surrounding the actual race (see: Most Outstanding Outfit competition). Come race day, if you’re lucky enough to score a ticket on a private yacht, try not to pickle yourself too much lest you miss out on those gorgeous sunsets unique to the Dragon Boat Festival. The party extends to Stanley’s main drag after the dragon boats have docked for the night. Dragon boating for the trendy Wong Chuk Hang set, the Aberdeen Boat Race calls to those who want a less-crowded venue than Stanley. There are loads of food and drink stalls set up to keep your bellies from grumbling while you and your entourage double clap for the winners. Arguably the most cultural of HK’s dragon boat races, Tai O celebrates the century-old tradition of the Tai O Deities Parade, where statues of local gods are towed behind dragon boats to pacify the island’s water ghosts, then returned to local temples. A must for families, DB’s 25th annual celebration is held at Tai Pak Beach, just meters away from DDeck (FYI – book your tables in advance to get the best race views). Families can gear up for the races with DB Plaza’s Carnival as early as Sunday (from 10:30am to 6pm), where kiddoes are treated to bubble dancing, magic shows, puppet shows, and fire dancing. Take note of the Short & Sweet Horse-Drawn Carriage Ride around DB North, for families who want to take a respite from dragon boating. On hand again this year is the Hong Kong Disneyland “Best Cheerleading Performance” and beer drinking challenge for the ‘rents. If you’ve only been out to Sai Kung for fresh seafood and squid fishing, you’re in for a treat with the Dragon Boat Festival. Take in the race with locals as you’re surrounded by the festive atmosphere, food stalls, crafts vendors, and more. 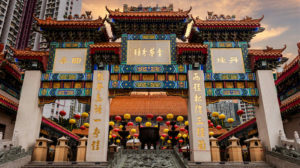 Come for the morning’s races, and stay for the afternoon carnival at Tin Hau Temple. Just across a short stretch of water from Discovery Bay, head to Cheung Chau’s own Dragon Boat Festival. While we can’t guarantee the same spirit as the Cheung Chau Bun Festival, you’ll join in the revelry of inhabitants that call this island their home. Taking place in the Castle Peak Bay Typhoon Shelter, this race provides a more intimate venue for watching the festivities. Heading toward the north, Sha Tin’s own version of Dragon Boat Festival is held at the bridge-to-bridge venue of Shing Mun River, between Banyan Bridge and Sha Yin Bridge. Nature lovers should head to Tai Po for Monday’s dragon boat competition, using the largest park in Hong Kong as its backdrop. If you tire from dragon boat spotting at sea level, head to the lookout tower to get a panoramic view of Tolo Harbour. For those landlubbers and beer enthusiasts who can’t be bothered to step foot near an actual race, San Miguel BeerFest – the free, 3-day binge fest at TST’s Centenary Garden – coincides with next weekend’s CCB (Asia) Hong Kong International Dragon Boat Carnival. You can be a winner too with events such as the “Guzzler Challenge”, the nail biter of all drinking competitions. Dragon boat competitions in Mui Wo, Lamma Island, and the Tai O Dragon Boats Racing Competition are held at alternate times during the year.